The first maps made of our earth weren’t very accurate at all. They were mostly drawn from imagination. The European maps from these medieval times are called mappae mundi (meaning “cloth of the world”) and they really weren’t intended to be used for finding your way around at all. They were more like medieval encyclopedias that were used to illustrate stories, show directions, and tell about species of animals, other races of people, and plants from places near and far. Mapmakers of their day really couldn’t have made the accurate maps we use today because we rely on satellite imagery that wasn’t available all those years ago. Take a look at this mappa mundi. It would’ve been used to teach stories rather than navigate. Can you spot a story that’s familiar to you? 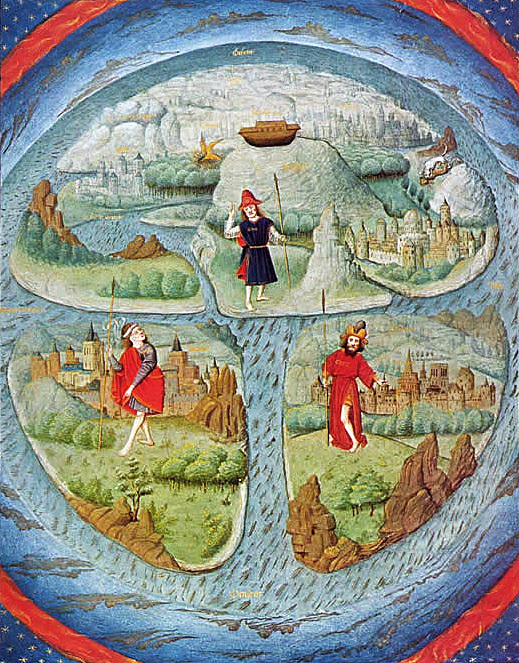 “MAPPA MUNDI in JEAN MANSEL La Fleur des Histoires. Valenciennes, 1459-1463, This image is in the public domain because its copyright has expired. Our world maps today are incredibly accurate, except that we still have difficulty depicting a round earth on a flat piece of paper without skewing parts of it. (Generally school children believe that Antarctica is a long, skinny continent, when it’s actually quite roundish.) Satellite technology, computer graphics, and aerial photos give us a very clear picture of just what our maps should display. With accurate maps and GPS systems built directly into our smartphones, it’s pretty easy for us to navigate around this globe of ours. Even though we have GPS these days, it’s still important for kids to understand how our map grid system works. Map grids are pretty simple; young kids can begin by just adding 2 of our imaginary grid lines – the equator and the prime meridian. These are like the zero lines for the rest of our earth’s grid. Use this printable map of the world and glue a 1/8″ wide piece of ribbon to the equator. We used purple ribbon for the equator. Explain that if we were there standing on the equator, we wouldn’t see a line at all. We have just put an imaginary line on our maps to represent the line that divides the globe in half, exactly the same distance from the north pole to the south pole. You might want to talk about what else the kids know about the equator (like mine were quick to point out that it is warmer there because of the close proximity and directness of the sun to the equator). Next we added the prime meridian – a yellow ribbon. The prime meridian is a line we use to divide the eastern hemisphere (half-globe) from the western hemisphere. Again, just an imaginary line mapmakers use. Then I asked the kids to find the coordinate point that intersected closest to where we live and mark it with a pink star and then trace those lines in pink as well. They were able to tell me our own coordinates where we live. Our maps turned out to be colorful and memorable learning tools. Learn to list specific coordinates of cities and landmarks. Learn about what latitude and longitude mean. Play this cool Globe Trotter Game. There’s lots more to learn about maps and how we use grid lines and coordinates to find our way around earth. You can find tons of cool mapping activities Units 1-1, 1-2, and 1-3 of our catalog. There is a lot more to see and do at Layers of Learning. Our catalog is full of really fun, affordable units for your homeschool family. We also have homeschooling helps and advice from Michelle and Karen, lots of free exploration-style lessons, and free printables too! Thank you for the great ideas! I’m using these today with my kids in our study of Pirates, and I’ll be sharing on my blog, too. This is a truly fun, instructive activity! Thanks for sharing it with us! My 5th graders loved it, and it helped them visualize Latitude/longitude so much better, and also had fun finding other places on the map. Thanks Janet! We love to hear when the things we write help kids learn better! Thanks for being an awesome teacher and going the extra mile for your kids. I am a teacher from the Philippines, i saw your site at you tube and use your technique and the procedure on how to teach the grid of the globe. my pupils got the lesson quick and the same time they had fun doing the activity being creative at the same time fun… I’m so happy i found this site… thank you and more power!